Every week -- often with your help -- Food52's Executive Editor Kristen Miglore is unearthing recipes that are nothing short of genius. 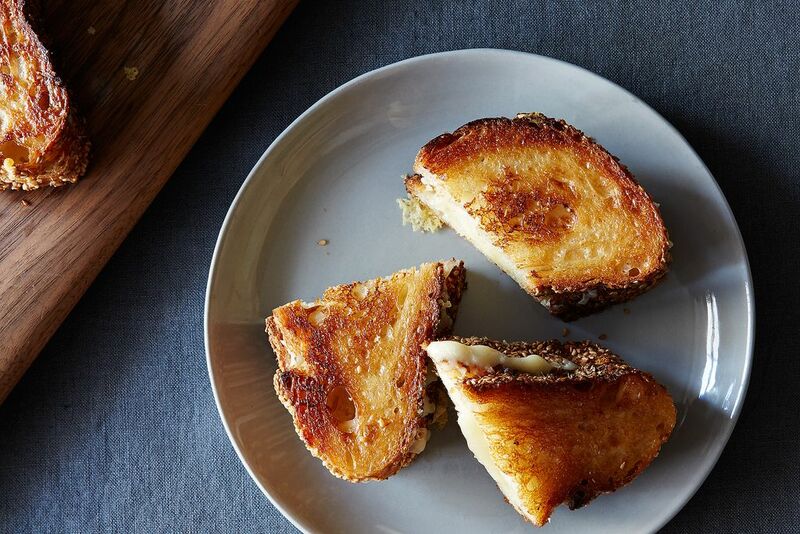 Today: The secret to crispier, faster, better grilled cheese sandwiches. A grilled cheese sandwich is a perfect union of bread, butter, and melty cheese -- so why would you ever want to turn your back on one of its key ingredients? Especially if that ingredient is butter? 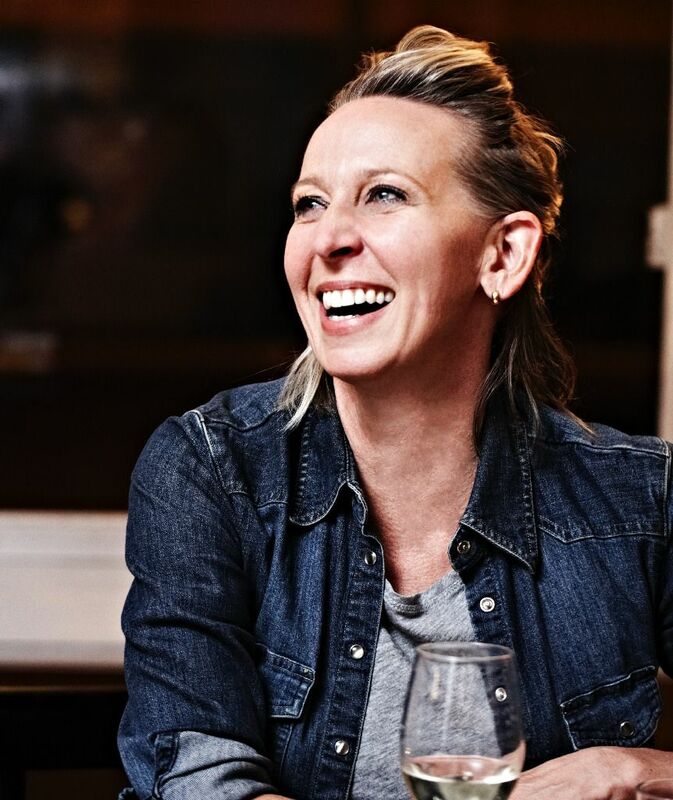 Lots of reasons, as I learned from Gabrielle Hamilton, chef and owner of Prune. Even diehard lovers of the buttery version (I am one) will find something new and valuable out of smearing their bread with mayo instead. As she says in this CHOW video, "This is the greatest cooking medium of all time for a grilled cheese sandwich." 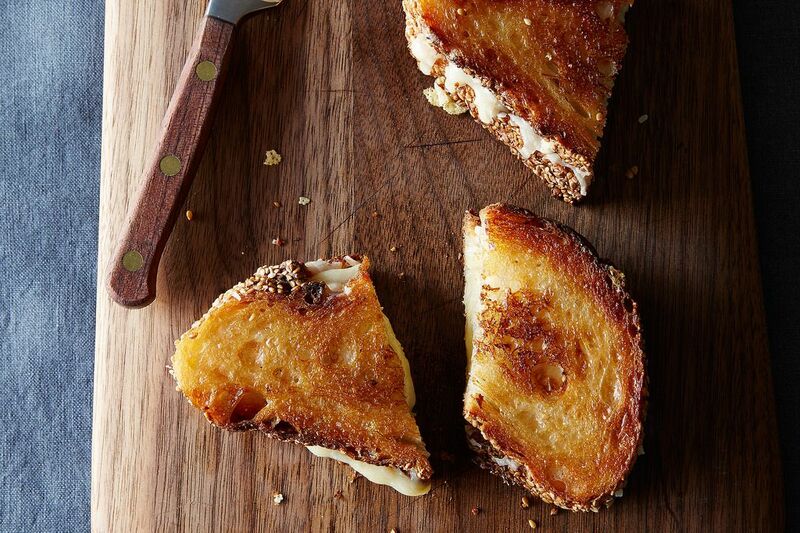 Mayo won't burn as easily as butter does, which -- just like that -- solves the biggest challenge of grilled cheese: how to get the insides to heat through before the outside blackens. More: Throw a dinner party for your cheesy sandwiches (with tomato soup). 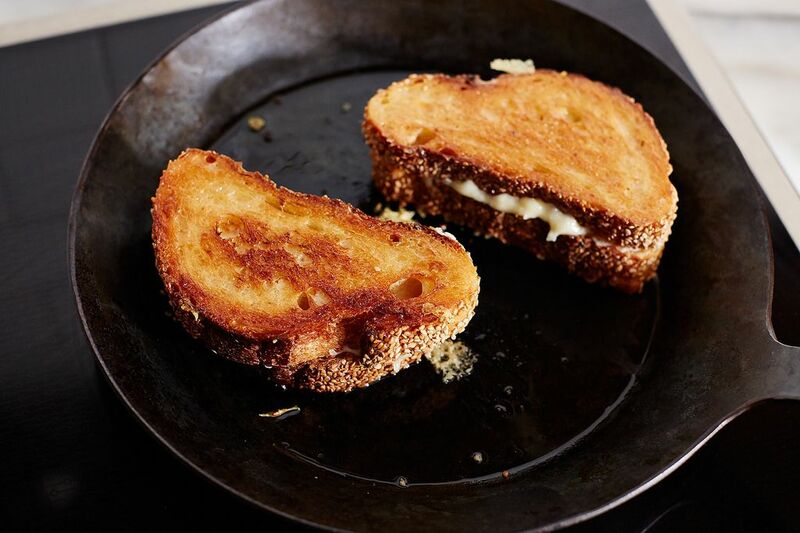 With a standard, buttered grilled cheese, you have to cook it low and slow, keep the pan covered to capture the heat, and peek compulsively to make sure it's not starting to smoke -- or involve an oven. But if you rely on mayo instead, you don't have to stress -- its smoke point is higher than butter's, so it's much less likely to turn on you. You can also have grilled cheese sooner. 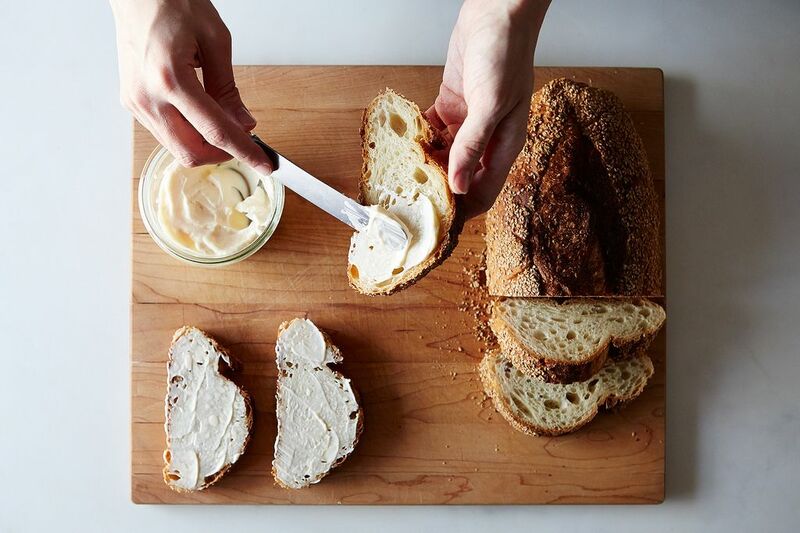 You don't have to wait for butter to soften, or tear or smush your bread in haste -- even downy slices of brioche or Pullman won't be damaged when you slip over them with a knifeful of mayo, which is blessedly soft at any temperature. But these are matters of convenience and reliability; what's most important are the results, which are not like any grilled cheese that butter could make. The oil and egg in mayonnaise brown and crisp more evenly and lavishly than butter, creating a glossy crunch from edge to edge. 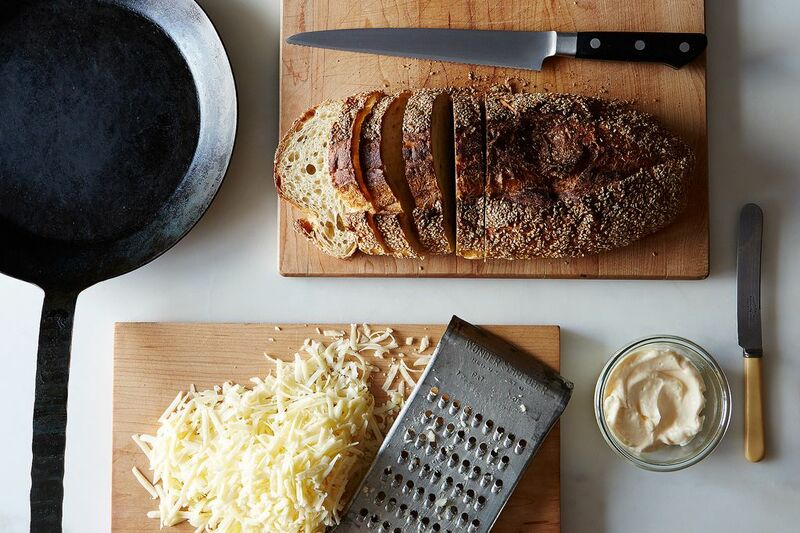 Hamilton's recipe -- like so much of the honest, happy food she serves at her restaurant Prune -- is a comforting balance of high and low: extra-sharp cheddar spilling out of good bread, plus mayo in a jar. She's also known to serve sardines and Triscuits on the same menu as chicken liver mousse with Cognac jelly, and to drop Knorr bouillon cubes in the vegetable soup she makes for Christmas Eve. She serves that soup with expensive Champagne -- not a bad idea here either. Got a genius recipe to share -- from a classic cookbook, an online source, or anywhere, really? Please send it my way (and tell me what's so smart about it) at [email protected]. Thanks to Food52er Kukharka for this one! I’ve been using ghee for the past year or so on and it works perfectly. Browns nicely and is always spreadable at room temperature. Only butter for me--if the ingredients are the proper temperature and the cooking is slow and steady, lovely butter is best! Mayo imparts a distinct flavor. Not a fan. I melt bacon fat in my pan and put both pieces of bread in, add the cheese and whatever, then put the two pieces together. It's better than butter or mayo in my opinion. I also store my butter at room temperature and I heat the skillet a bit before adding the butter so it doesn't burn just waiting for the pan to get hot. Mine come out crispy outside, melty inside and delicious! Nonsense! Butter works just fine, unless you're too lazy to flip the sandwich frequently. I use mayo instead of eggs in meatballs or meatloaf. I tried mayo once........burned my sandwich right away. Did not like it at all. I'll stick with butter. I have no problem getting the cheese to melt perfectly, without burning the bread. So sorry! I have no idea why it posted like that with all the plus signs! I am going to try this with my wonderful, magical, genius "Cooks Illustrated Almost No-Knead Rustic Bread." I've been using mayo like this for awhile now & even the mayo haters have to admit it's pretty good! Now keep your minds open for this one...COCONUT OIL! Especially good if you add a little chutney to the cheddar or play up the flavor in other ways. Try it! Have made this twice since reading....EXCELLENT!! I've never tried using mayo instead of butter, but it sounds interesting. I do like thinly sliced dill pickle in my grilled cheese though - yum! I haven't tried the mayo, but we store our butter at room temp so it doesn't tear the bread. My husband loves it when I make his grilled cheese with Old Bay on it, sprinkle on the butter before you put it in the pan and you get a nice crusty flavor. I'm willing to try this, but truly, I feel I'd be messing with perfection.